What follows will most likely be of little interest to the bulk of you. For the past few years I have been working to drive and weave the resources for my writing ever more densely into the thickety webs of my authentic experience of the world. Normally I press this through interdisciplinary inquiry into ways we make meaning, or co-construct what we live as relational/relating realities, attempting the time and effort of translating and investigating these passions and fascinations through creative genres and forms. However, life events of the past couple of months have greatly constricted available moments or periods for research and reflection, and magnified the complexity and overwhelming magnitude of our multi-layered, cross-scaled, relativity-dimensioned (see Multi-Sense Realism, et. al.) actual experience of living as human beings. The most authentic and naked (or base) way I have had of “making sense” of my experience has been, for most of my life, to do it on blank pieces of paper with a writing utensil in hand. This has enabled my body, like a court stenographer or EKG, to jitter out marks and symbols of what happens to it, get strange glances at the process, notate various strata of its responsive-formative interactivity and selection, and extend/diminish/further and edit or retract (evolve) its activity of living survival. The past 65 days have been characterized for me by grief and bewilderment, gratitude and wonder, tectonic shifts and rejoined connections, breakings and openings, terror and panic and archaic survival strategies, and desperate hope and frenzied imaginings…I suppose you could call it trauma, dramatic change, upheaval…LIFE. I have found employment – fraught with uncertainty still, but employ – and something about that one structural determinant has triggered me to assay an account, as much for myself as for anything else…to make the time to manufacture a kind of map for myself of what has and is occurring in my life in this span. All of this is to say that I plan a series of posts that will be intensely personal, self-revelant, my own way of reaching toward my experience, my being, and selecting language with which to mark it down – for re-memory, re-cognition, observation, reception, attention, account. These are journal entries, frankly. They are what I have to write. I am calling them “Mapping the Meaning.” Since I know very few of you personally, in your whole presence, I expect confession, inquiry, and its self-circular expression to genuinely interest or benefit very few of you. 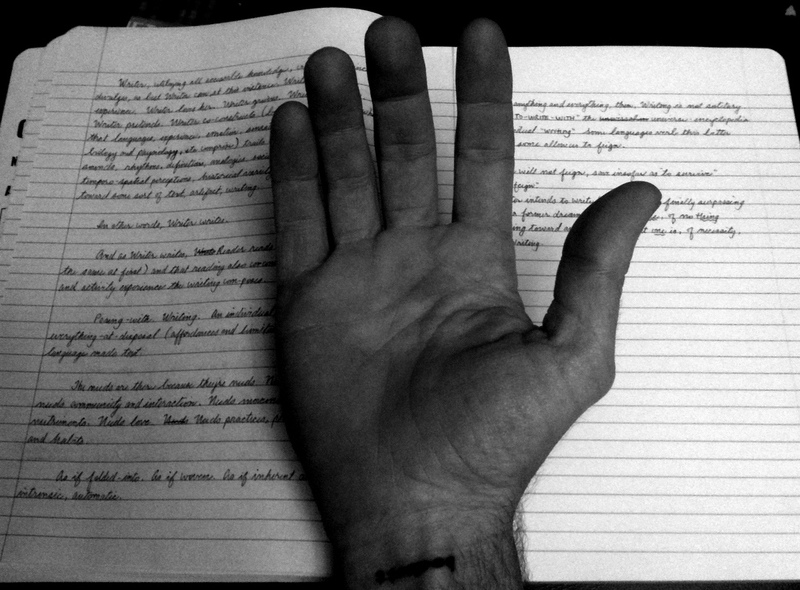 For me, it is writing with an open hand. Bold. And I’m happy to hear you landed a job! Pingback: Locations in the Mapping of Meaning | "The Whole Hurly Burly"
as jz says above: bold, but more than that; there is a bloody pulse of life which connects me and squeezes me into the string of words – opens up worlds, painful and startling beauty. A more intelligent art reflects back my own glorious, tedious struggle in a “bruised” light of recognition – I doubt I am among few here. If you can tell the truth and not hide behind language simply because the words are recorded, you will help others. Pingback: Scrambling… Scattering Notes | "The Whole Hurly Burly"